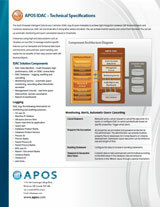 Download APOS Solution brochures for a high-level description of how these solutions can help you improve ROI. Manage Smart. Manage Strong. Manage Simple. See how APOS Well Managed BI solutions, Well Managed Analytics solutions, and Hybrid BI solutions can help. Take command of your BI deployment. The suite of APOS well managed BI solutions streamline your SAP BusinessObjects workflows with high-volume administration, system auditing and monitoring, system storage, content validiation, BI query governance, and systematic content delivery. Unlock live data for SAP BI. Simplify data discovery and the user experience while enforcing greater information governance. Automate testing of Web Intelligence, Crystal Reports, Crystal Reports Enterprise, and Analysis for Office reports in a controlled, project-based environment. Expanded distribution options for SAP BI, including enhanced encryption, destination types, security, formats and print controls. BI Launchpad integration and distribution governance make APOS Distribution Server an excellent fit for organizations preparing for Genera Data Protection Regulation (GDPR) compliance. APOS well managed BI solutions provide enhanced scheduling, distribution, impact analysis, bulk instance management and failure recovery, and robust archive and backup. 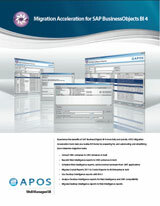 The APOS Insight solution provides the system metrics, impact analysis, performance analytics, and many other capabilities you need to optimize your SAP BusinessObjects environment and infrastructure, to establish complete confidence in your content, and to ensure industry-specific regulatory compliance. Experience the benefits of SAP BusinessObjects BI 4 more fully and quickly. APOS Migration Accelerator products help you realize ROI faster by preparing for, and automating and simplifying labor-intensive migration tasks. APOS Administrator solves the administrative problems you have right now, and prepares you to solve problems you will experience as the demands of your information consumers grow. Go beyond a curative approach to BI platform management. 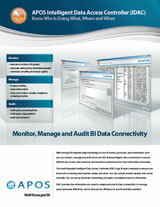 Achieve well managed BI through agile administration and optimal BI platform management for SAP BusinessObjects. The multi-threaded Intelligent Data Access Controller (IDAC) logs BI query metadata to ensure you know who is running what queries, where, and when. You can actively monitor queries and cancel remotely. You can set up automatic monitoring and query cancellation based on thresholds. IDAC provides the information you need to understand your BI data connectivity, to manage query processes effectively, and to increase the efficiency of your BI and data solutions. APOS Storage Center automates the archive and restore functions in your SAP BusinessObjects deployment, helping you to manage the document lifecycle, safeguard data privacy, and achieve regulatory compliance. 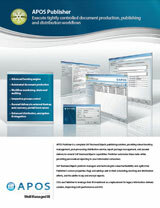 Advanced bursting, consolidation, assured delivery, complex statement processing.